Early spring is prime season for certain weeds. Without tree cover blocking the sun and with temperatures still too cool for many other plants to germinate, some weedy plants are able to get an advantage. Lesser celandine (Ficaria verna) is a one such “spring ephemeral”—a term typically reserved for the native woodland plants that come and go in this narrow window of time, including many delicate beauties like trout lily and trillium. Lesser celandine is actually an aggressive European plant, vilified by native plant enthusiasts for its tendency to emerge early and carpet the forest floor, edging out local flora. Still, since it shares the same strategies with its local counterparts, I think the name applies. A member of the buttercup family, lesser celandine can delight the eye when it first emerges. Its bright yellow blooms against dark green, glossy leaves are quite stunning, especially following the drab browns and grays of winter. But don’t be tempted to choose this plant as an easy groundcover! It originally came to North America as a nursery plant, and some nurseries still sell it. 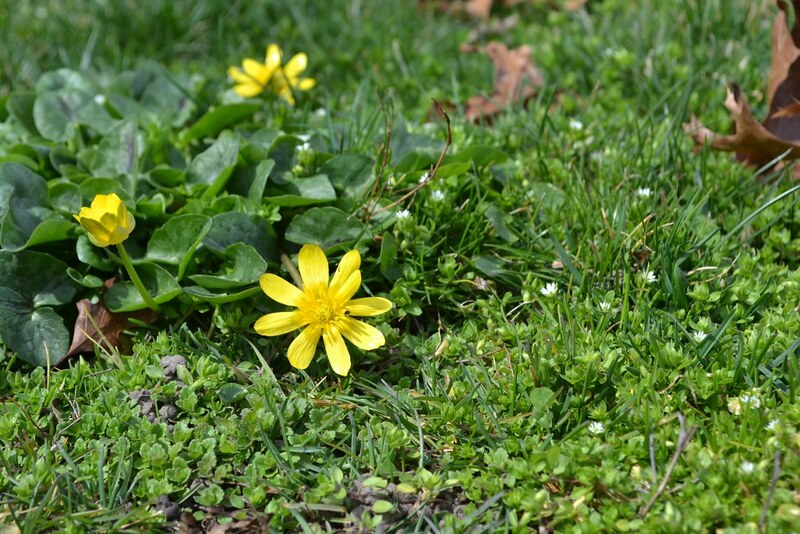 However, lesser celandine is now considered an invasive weed in 25 states, including New York, and its steady spread worries ecologists and land managers alike. Besides timing, lesser celandine has another important advantage over its native neighbors. It reproduces vegetatively, through underground tubers. So if you attempt to keep it under control by pulling it out, be sure to dig up those tubers or else you’ll see them again next year. Before you dig, though, make sure you’re not attacking the similar-looking native plant marsh-marigold (Caltha palustris)! 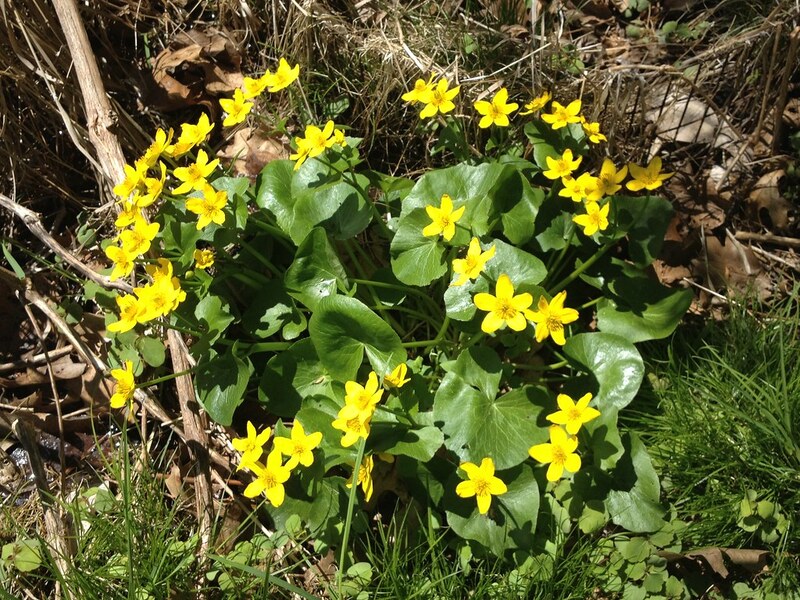 Both love damp areas and have yellow starburst flowers, but marsh-marigold grows in clumps, not dense mats, and its flowers have 5 to 6 petals, many less than the 8 to 12 petals of lesser celandine. Marsh-marigold actually makes an excellent, ecologically sustainable native alternative. If in doubt, check the underside of the flower. The marsh marigold has yellow sepals but no petals. Lesser celandine has yellow petals and beneath the petals are 3 greenish sepals. Ficaria verna (lesser celandine) blooming in the Plant Family Collection lawn. Photo by Blanca Begert. Caltha palustris (marsh-marigold) in the Native Flora Garden. Photo by Ruiyan Xu.